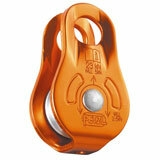 Petzl Micro Pulley 1/2" Capacity & Fixed Cheek Plates Orange. A popular Fixed cheek plate from the well know manufacture, Petzl. Aluminum Cheek Plates and Sheave.